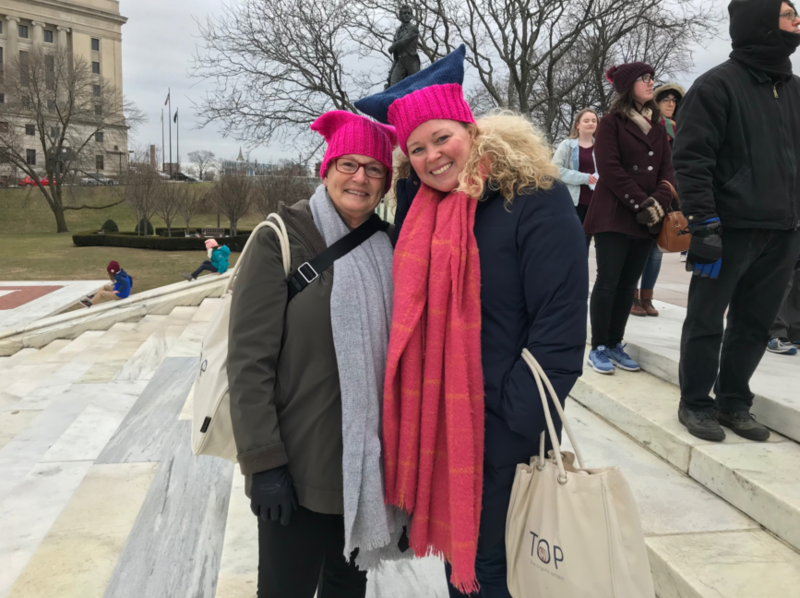 Carrying anti-Trump signs and wearing pink hats, protesters gathered on the cold steps of the statehouse Saturday, joining groups around the country holding Women’s Marches this weekend. Activist groups that planned the rally in past years decided not to hold a march this year, after distancing themselves from national organizers. But some local activists wanted the march to happen anyway. Liandra Medeiros stepped in to organize the rally after last year’s organizers split from the national march. Medeiros previously participated as a speaker at the Women’s March in Providence. She said, she thought it was important to continue offering a space for people to speak. “The first time I spoke, it was cathartic. And I felt like I needed to hold the space for people who were feeling the same way I did,” Medeiros said. In the days leading up the march, Medeiros said she wasn’t sure how many people would show up, but she thought it was important to have an event regardless. “I mean even if only 10 people show up — because I know it going to be super cold – I just want to have a space for people,” Mederios said. About a hundred and fifty people gathered at the statehouse, way down from turnout in past years. Some participants were surprised by the low attendance. Providence resident Denielle Finkelstein came to the statehouse with her mom. “My mom and I, we didn’t realize it had been canceled until we showed up. So I think we were both a little shocked because last year the crowd spilled out into the field here and also all along the steps,” Finkelstein said. Her mom, Sharon Lee said the smaller crowd size was disappointing. “I thought Rhode Islanders were a lot more behind this,” Lee said. 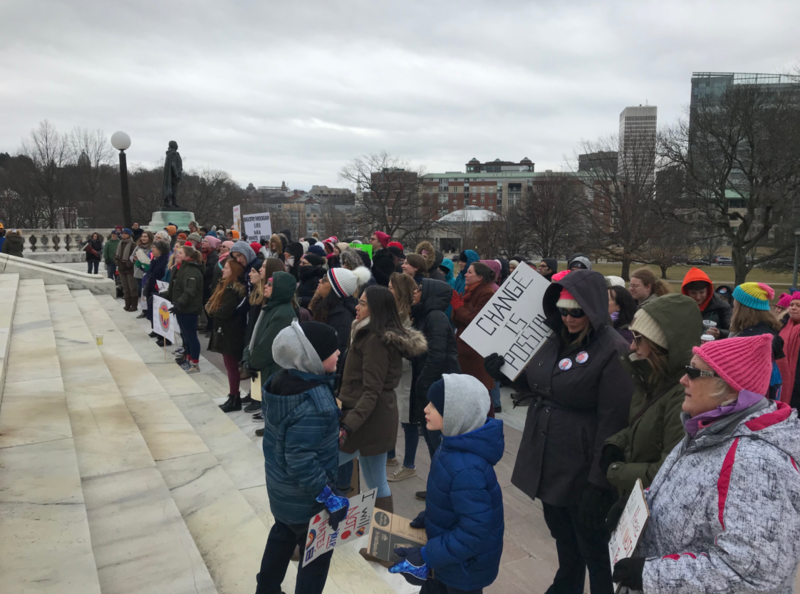 She continued, “Even though things are tough I think we have to show up, show our face and show our voice.” Rhode Island activists who organized the march in past years announced early in January that they would not be organizing a local march this year. Leaders of the group, the Rhode Island Womxn’s Initiative, said the National Women’s March didn’t do enough to reject anti-Semitic views expressed in a speech one national organizer attended last year. Shanna Wells, a representative for the Rhode Island Womxn's Initiative, said the group is continuing to work to get female candidates elected, and advocate for legislation on issues including reproductive rights, gun control, and raising the minimum wage. Women's March protesters on the steps of the Rhode Island Statehouse, January 19, 2019. 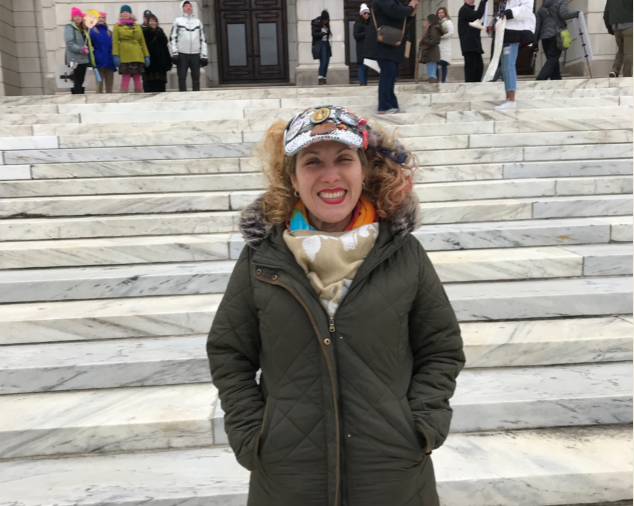 Liandra Medeiros organized the 2019 Women's March in Providence, RI. Sharon Lee and her daughter Denielle Finkelstein at the Women's March in Providence, January 19, 2019.